During model year 1993 the 911 Turbo was upgraded from 3.3 to 3.6 litres. Production finished February 1994 with the last of the X88 / Flatnose . 406 cars were produced for the North American market and 1001 for the rest of the world – worldwide total 1407 – factory numbers . Just 159 of these were right hand drive , including all the special versions. At least 30 went to Brunei and most of these may never come on to the market . The new engine M64/50 produced 360 bhp @ 5,000 rpm raising top speed to 175 mph and lowering 0-60 to 4.6 seconds. Torque increased to 520nm @4.200 rpm which solved the 3.3 cars lack of off – boost performance . Substantial brake and suspension upgrades were included. The Big Red brake calipers were introduced along with larger brake pads. During internal tests Porsche recorded outstanding braking distances along with 1.2g on deceleration. The suspension upgrade included MO30 as standard (except for USA), this lowered ride height by 20mm. The rear axle was changed to the Carrera RS type. Limited slip differential (20%) upgraded with carbon plate. The 3.6 model now featured the iconic 18 “Speedline for Porsche” split rim alloy wheels with low profile tyres. “S” cars featured Polished versions ( option 407 ) available 285 width rear tyres . Dealers were allocated one or two cars in a standard colour and very few customers were able to specify options to add to the already record high basic price . However, at the start of 1994 Porsche Exclusive department built some very special run-out versions. These were to be the last of the hand built cars, costing a minimum £130,000. Many were destined for elite customers such as the Sultan of Brunei. 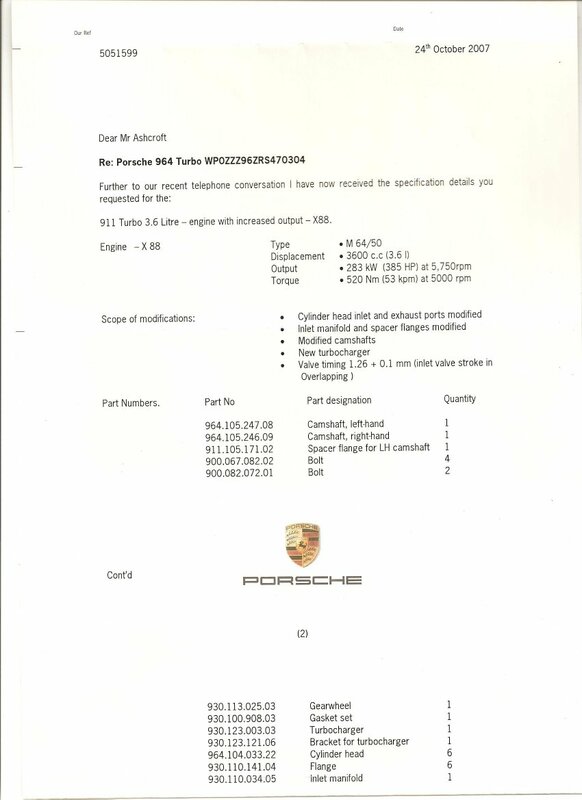 The Sultan and his brother Prince Jefri ordered at least 12 3.6 turbos with Porsche Exclusive options and/or RUF enhancements . Register no.1 in special order Horizon Blue Metallic is an example. It was dyno tested at Ninemeister and produced 402 hp and 556 nm torque. It has unique option X26 Full leather airbag / steering wheel and Ruf EKS etc from new. Details of these cars were not widely available at the time and not formally acknowledged by Porsche until recently (911 history DVD, Porsche 2004). A few of the Brunei cars were auctioned and given export status around 2003 due to a family squabble . These included 4 X88 3.6 Turbos , one of which came to the UK and the others went to NZ . Many were sadly left unused to decay in humid conditions – a tragic waste of Stuttgart’s finest. Full story here. A few years later a black flatnose car is believed to have been auctioned and left for Hong Kong and a few more of the good ones have passed to Brunei residents . 76 Specials were Flatnose, 17 were *Package* cars and 10 RHD Japanese Flatnose versions similar in style to the earlier 930 Flatnose cars. Each car featured the X88 Turbo S engine package, producing a minimum 385 bhp (more details) For authenticity note that “S” is stamped on the engine block. There were up to 49 X88 in optioned cars or supplied to racing teams. X88 had the 40% Diff. * The Package cars were non – flatnose USA only run out versions. X88 , front spoiler , rear spoiler in body colour , front & rear wing vents , dual exhaust tips and polished Speedlines. The car was used in Weissach as a research and test car. The car, specially the engine, transmission, etc. was build with many prototype parts known as PV 0 parts (Porsche development zero series). Porsche drove in 10 months about 50.000 km and the car was sold after finishing development to a private person. Porsche itself says that this is the last existing prototype car. The 964 Turbo 3,6 was only build in Mj. 1993 with only 1400 total pieces. The same statement also exist from Porsche development center in Weissach and was documented in the Porsche delivery record. There were only 5 964 turbo 3,6l prototypes during the development process and 4 of these test cars were scraped by Porsche. 18 inch 3 piece Speedline – Porsche rims, full electric power seats with lumbar support, leather trim, bord computer, air conditioning, sun roof, power windows, immobilizer, ABS, power steering, power lock, rear window wiper, sport suspension, limited slip differential, Airbag diver and passenger side, sound system Blaupunkt, etc. From the beginning of development the 964 Turbo 3,6l Porsche intend this car as a twin turbo. They were running out of time and money and made the decision to build a single turbo. For this reason the car has an engine displacement with 3600 ccm (same engine like the 993 twin turbo) but they installed a modified mechanical injection from the older 3,3 l turbo.